New Winter 2018: Our collection of replica sweet treats for the tree includes cookies, pieces of cake and now this delectable design. 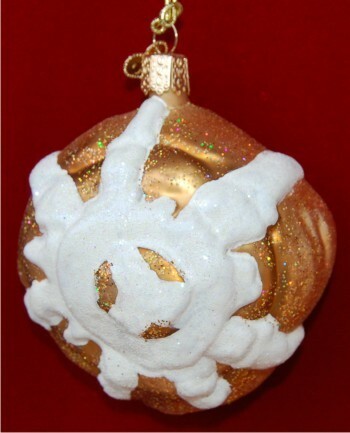 The delicious cinnamon roll Christmas ornament is produced from quality blown glass finished with durable and attractive lacquer paint invested with glitter. The result is a food ornament personalized by the artist, and one that adds a touch of something fun to the tree that any cinnamon roll aficionado will enjoy. Select this treat for friends with a sweet tooth or start your own collection of dessert-inspired decorations with the peace sign, sunshine iced cinnamon roll glass ornament for Christmas, a birthday or any special moment.